One’s tolerance of The Hitman’s Bodyguard largely depends on one’s acceptance of the “buddy action-comedy” rising from the grave like one of the zombies in a George Romero (RIP) horror flick. Indeed, the script for this rather generic endeavor feels like it’s been sitting on a desk since the late 1980s, gathering dust as stars like Schwarzenegger, Nolte, Glover and even Piscopo hemmed and hawed over whether to sign on the dotted line. Samuel L. Jackson plays the hitman, set to appear before the International Court of Justice in The Hague to testify against an Eastern European war criminal (Gary Oldman). Ryan Reynolds plays the bodyguard, an outsider who’s brought in to protect the hitman after it becomes clear that there’s a leak inside the corridors of power. The hitman and the bodyguard are sworn enemies, but by being forced to work together, they find moments of bonding amidst the hours of bickering. If it sounds entirely predictable and pedestrian — well, no argument there. Yet what saves the picture is the chemistry between its principal players. Reynolds and Jackson work exceedingly well together, and Jackson and Salma Hayek (as the hitman’s no-nonsense wife) also work well together. Yet what’s even more pleasing is that Jackson works well alone. It’s been a while since he’s surprised us as an actor, but here he’s loose and relaxed and very, very funny. 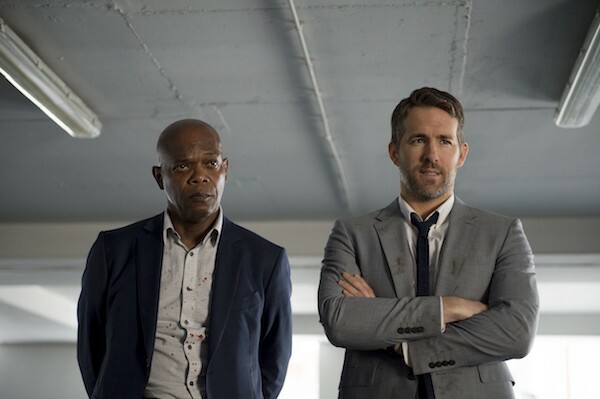 The Hitman’s Bodyguard features at least one tiresome car chase too many, and the final half-hour feels as if it’s going to stretch into next week. But even these debits can’t completely diminish the bullseye turns by the winsome protagonists.